Nevada’s recreational marijuana supplies are plentiful but not overly abundant, keeping wholesale cannabis prices on the high side compared to other adult-use markets. Business owners in the Silver State don’t expect wholesale prices to remain steep for much longer, however. “Supply is catching up,” said Andrew Jolley, owner of The Source dispensary and retail shop in Las Vegas. But prices aren’t expected to nosedive as they have in other rec markets, including Colorado, Washington state and Oregon. Looking ahead, the state will need plentiful supplies to meet continued robust consumer demand. Nevada’s adult-use market has been on a tear since its early start program went into effect last July. 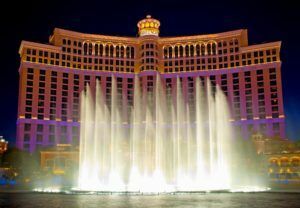 Sales are averaging $1 million a day, driven by the more than 40 million tourists who visit Las Vegas every year. That’s solid for a nascent market that has yet to reach full production capacity. Plus, prices in the retail stores haven’t dropped much, with some ounces of flower still selling for $350 or more. Growers also are commanding a decent price point for high-quality cannabis. The majority of cannabis in Nevada is grown indoors, though there are a few greenhouse operations. The state has no outdoor grows, limiting the amount of available production capacity. On Jan. 1, 2018, the state’s Department of Taxation assessed the average wholesale market price at $2,268 for a pound of flower and $601 for a pound of trim. Those prices are considerably higher than in other mature recreational markets. While those taxation department figures are based on cultivation transactions from April 2017 to October 2017, marijuana business owners in the state say there is a much wider range in prices. Business owners who spoke with Marijuana Business Daily said pounds of wholesale flower are selling for $1,800-$3,500 depending on quality, including THC content, terpene profile and a strain’s popularity. The flower Jolley is buying for $1,800 a pound goes on The Source’s value shelf. Higher-priced cannabis goes in the premium section. “The higher the THC content, the more you can command your price,” said Jerry Velarde, president of Evergreen Organix, which grows and processes cannabis in Las Vegas. Average flower, which has roughly 16% THC content and a moderate terpene profile, sells for about $2,300-$2,600 a pound, he said. Increased between July and October. Didn’t drop in October or November. Started to come down in December, when bulk purchasing deals became available. Nevada’s wholesale cannabis pipeline is sufficient at the moment, and business owners expect it to increase as more cultivation operations develop capacity and improve efficiencies. In the early days of Nevada’s recreational sales, Sillitoe said, retailers, processors and other businesses who needed wholesale cannabis had to preorder product from growers because of limited supplies. But that supply situation has since loosened up. “At this point, there really are no delays in getting inventory,” Sillitoe said. He expects to see supply continue to increase and prices to fall accordingly over the next year. “We’re seeing significant expansion from the wholesale side from a lot of different suppliers,” Sillitoe said. Jolley agrees there is enough supply currently and he expects wholesale prices to trend downward. But eventually there might be too much of a good thing for growers. “I think there’s actually going to be too much supply within the year,” Jolley said. Cannabis trim specifically intended to be made into oil is ranging from $400 to $700 a pound, depending on quality, according to business owners. Shane Terry – CEO of Taproot Holdings, a vertically integrated cultivation, production and distribution company in Las Vegas – said trim cost as much as $1,800 a pound in December but has since slid. He’s seen pounds of flower that failed laboratory testing with THC content as low as 5% still sell for $700 a pound for processing into cannabis oil. “We’re seeing incredibly high prices from people who are sending us product that’s failed for mold or microbials,” Terry said. Flower that fails testing is commonly sold to processors to be converted into oil, because the extraction process is believed to remove the impurities. The failed tests stemmed from cultivators having to deal with humidity issues during the winter months, Velarde said. “You’ve had a lot of guys who have struggled and have had a lot of failed flower,” he added. He admitted that the robust trim prices have taxed the processing side of his business. That’s also been the experience of Brandon Rexroad, founder and CEO of Shango, a vertically integrated recreational cannabis company with operations in Las Vegas and Oregon. He’s heard of people buying cannabis to be processed into oil for as much as $2,000. Rexroad explained that processors will pay top dollar to try to establish their brands in a highly competitive extraction market. “They’re willing to pay it just to get product on these shelves even if they’re not making money at that price point,” he added. Retail prices have remained consistent since the start of recreational sales, according to business owners. Prices are ranging from $250 to $350 an ounce for flower at most retail stores. When the state began recreational MJ sales in July, wholesale prices increased in relation to the medical prices, according to Sillitoe. But he didn’t raise his retail prices accordingly to maintain market share. “We ate that cost for our customers,” Sillitoe added. Velarde of EvergreenOrganix concurred that prices have generally stayed the same since the rollout of adult-use sales. Rexroad emphasized that Nevada’s tourist trade will continue to bolster the market.